Versace items are known to be distinctively rich and superior in quality and it is no surprise that their products are being imitated and made into worthless knock-offs, that most people aren’t aware of when making a purchase. Before spending your hard earned cash on a Versace item like a belt, you probably want to be sure you’re getting the real thing, and you will need to take proper care to avoid getting duped by counterfeit sellers. Here, in this article, we have compiled a few tips that will help you identify the key differences between authentic and fake Versace belts. One of the key things to examine in the course of buying a belt, is the quality of the leather. 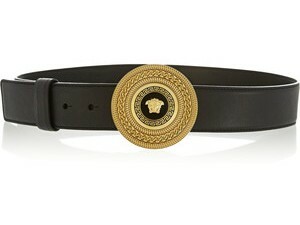 Real Versace belts are made from high-end material, thus the leather should be thick with perfect stitching. If the leather feels too light or thin, with visible sewing patterns, it’s not the real thing. Authentic Versace items are generally produced in Italy. If the Versace belt you are considering buying was made elsewhere, don’t bother wasting your money, it’s fake. Genuine Versace belts should come in medium sized boxes. If that belt comes in anything other than a box, it’s not genuine. Most sellers might try to convince you otherwise, but be smart enough to know the truth. Inspect the nature of the belt buckle: its metal parts should be firmly attached to the belt’s leather, with no signs of sloppiness, and should be correctly fitted and joined together. The Versace Company has adopted a very efficient means of verifying their products. To make sure that your product isn’t just another ordinary replica, check for the 12 digit CERT-LOGO Code on the label. If you can’t find it anywhere on the belt’s label, then it’s a fake. Watch out for a discount price placed on the belt. Is it too good to be true? Genuine Versace products are expensive, so if that belt is too cheap, then then it could only mean one thing: it’s probably fake. If you've applied these tips and are still unsure, then simply ask for a money back guarantee or a return policy from the the seller; if they refuse to give you one, then you probably should steer clear.